An early awards favourite, I tried to avoid hearing too many specifics about this film in advance but there were still a few things that got through, certain expectations and some thoughts I couldn’t completely shake from my mind while I was watching. 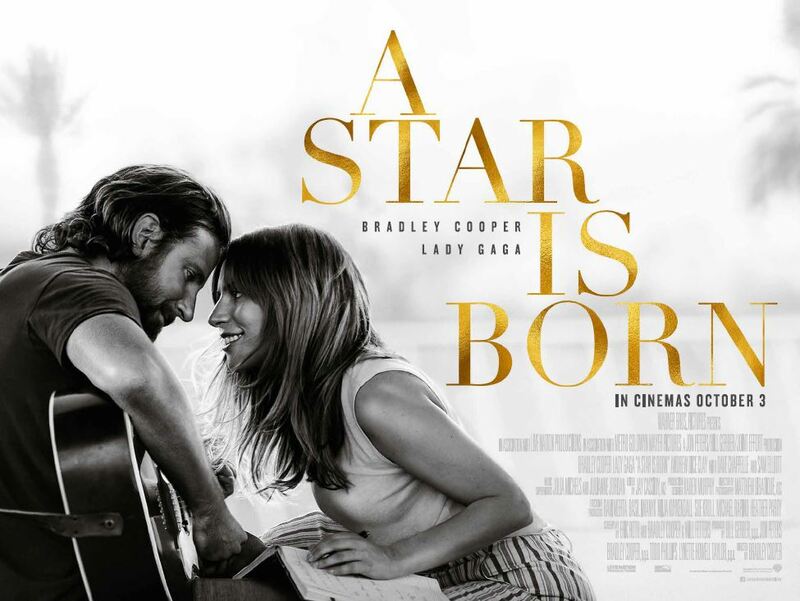 The latest retelling of the classic tale, Jackson Maine (Bradley Cooper), a rock musician with serious addiction problems meets a young singer (Lady Gaga) and gives her a boost into the industry as they fall in love, only to watch as fame and success change her life completely and puts increased strain on their relationship as he fights his demons. This is the fourth film adaptation of this story (fifth if you count the Bollywood version though that was under a different name), with earlier versions featuring such huge stars as Judy Garland and Barbra Streisand. One scene talks about there being only so many notes, what’s special is how you play them and what you have to say. Each director has had to update the story, change it a little to feel relevant and reach a new audience. The gap between the last version and this has worked in its favour, as we live in a time where technology and social media have changed the way we relate to celebrities and even interact with them, wholly different to anything even imagined back in the 70s. Before getting into the main point’s I’ll start by saying that the supporting cast is very good indeed. Cooper has devised a bit of an ‘Alias’ reunion here, as alongside himself there are small roles for Greg Grunberg and Ron Rifkin who both share screen time with him. Andrew Dice Clay is excellent as Ally’s father, his more serious roles are showcasing his potential as a really dependable actor after this and his performance in ‘Blue Jasmine’. It was also good to see Anthony Ramos (Hamilton) alive (I had to hold back the tears) as Ally’s friend though he doesn’t have a musical part which is a bit of a shame. The best of all supporting roles though goes to Sam Elliott as Jack’s brother Bobby, a man with a deep voice and even deeper emotions, torn between loving and wanting to support his brother, but not wanting to watch him self-destruct. They share only a few scenes but the chemistry is outstanding and Elliott defines what a supporting role should be, not so much stealing scenes from the lead, but working in perfect harmony to give them their full impact. It’s incredibly frustrating when there’s something in your head and it’s hard to shake while watching a film. One such thought occurred to me when the lead character was on stage with his initials, JM, large on the backdrop behind him and his music had a slightly familiar vibe to it. I was reminded of John Mayer, who I’ve seen live a handful of times, especially one of his albums a few years ago. The character then seemed to me like a darker version of Mayer if he hadn’t started getting his personal life together a few years ago. Eventually, I started to put that thought aside, until lo and behold Mayer’s best friend Dave Chappelle turns up and the notion was back and stronger than ever. I’m not the only one who made this connection, and though the character is far from Mayer in many ways, I was unable to completely shake the comparison. Jackson’s problems are many and serious. The troubled musician with drink and drug addiction issues is a familiar trope, though his demons go far beyond that. Cooper himself has spoken of his experience of similar addiction and serious mental health problems, something we get signs of at a few points in the film. Many scenes contain very serious warnings if you understand the importance of what may seem like even a dismissive line. There’s a conversation that goes to dark places, where I worried that the counsellor Jack is confiding in should be more attuned to how worrying what he’s saying really is, as should we all. This feels like there’s a missed opportunity here for characters to be clearer in how someone should and should not respond to someone expressing such signs of serious illness. Both are shown, definitely one character whose callous selfishness made me actually shout at the screen in frustration. Many have found the ending didn’t feel right for the characters we have just seen developing, though I’ve checked and it’s one instance of the film holding closely to the narrative of its predecessors, whether it should’ve been a point of divergence is debatable. Almost everything is filmed in tight shots, bringing us closer to these characters than is at times comfortable. There’s very little in the way of wider shots, the extensive close-ups at times make it uncomfortably imposing, clearly to reinforce the notion of how people now can get ‘close’ to celebrities. This is something Bradley Cooper and Lady Gaga as A-list celebrities must have first-hand experience of, so the way Cooper has directed it makes that a prominent feature to reinforce those contemporary issues in this adaptation. Cooper has multiple roles in the production, as first-time director, writer and producer, joint lead, and he also collaborated with Gaga and others on the music. In his on-screen performance he has worked hard to lower his speaking voice, which at times just sounded like Bradley Cooper with a cold, but after a while I got used to it and if I didn’t think about it the difference was enough to help round out the convincing character. His musical performances are very good indeed, you can tell he’s the one singing and completely believe he could have had a rock career. An actor who can sing convincingly is great, but really Lady Gaga is the big talking point, it’s far rarer to get a pop superstar who displays excellent acting ability in a leading role. She’s fantastic, there aren’t really any moments in which I felt unconvinced by her performance, she’s taken this very seriously and does a fantastic job. Still, it’s hard to forget that she is who she is. It’s really odd that the songs in which the music is getting further from the character’s roots and identity, are those that are by far the most familiar ‘Lady Gaga’ sound. Many were not only written by her but also produced by the same collaborators as some of her biggest hits. To that end, it’s almost like watching the development of Gaga in reverse. Despite some fantastic acting, I struggled to completely put that it was Lady Gaga, pop superstar, far from my mind, which threatened to pull me out of the movie, making a large part of the middle section of the film not so effective. If I watch it again and can keep those thoughts at bay, I think it will work better. Music is incorporated into the narrative in such a way that it can be considered a bona fide musical, becoming the third biggest soundtrack of 2018, behind the obvious ‘Greatest Showman’ and ‘Black Panther’ (that was really an augmented Kendrick Lamar album). ‘Shallow’ is getting most of the attention as it’s a really great duet for the romantic leads and in the context of the narrative holds much importance, that although heavily inebriated, Jack can somehow remember all the words and melody after Ally sings it to him once in a car park, signifying that somehow she can get through to him in a way that cuts through all his inebriation, a bit of Hollywood contrivance that can be easily forgiven. Controversially, I think there’s another song that may actually be better, ‘I’ll Never Love Again’ while not as pivotal to the character or narrative development and more a solo performance (so not as marketable as a duet with Cooper and Gaga), is the one that got to me emotionally. I’ve listened to it so many times since seeing the film, it’s outstanding. Throughout the film I didn’t feel like I was becoming hugely invested in the characters, especially as I had all those external thoughts bouncing around in my head, but then the last scene somehow got to me. The crucial song was so powerful and ensured the emotional impact of the film was carried across the finishing line. There was one messy cut that served an excellent purpose but could have been neater, but otherwise, that ending was very powerful stuff, a fitting way to wrap the story with what I think is the film’s best song. They then squeezed a couple more songs into the end credits, which I fully understand but the film could’ve been so powerful and lingering if that was left as the last vocal track. Next time I watch the film I’ll try just pausing when it goes to black and let it breathe a little more, I have no doubt it’ll be effective. An early favourite to get loads of awards, it was nominated in seven categories at the BAFTAs with Bradley Cooper collecting just one award for the music, while Gaga was on the other side of the Atlantic simultaneously winning a pair of Grammy Awards for ‘Shallow’. I think it’s the favourite to win the Oscar for Original Song in a couple of weeks, though if it will win many more than that in the 8 categories it’s nominated in I can’t be sure, though Sam Elliott’s outstanding supporting role seems to have a good chance. This entry was posted in BAFTA 2019, BAFTAs 2019, featured, Film, Oscars 2019 and tagged 2018, 2019, Academy Awards, awards, BAFTA, drama, featured, film, golden globes, movie, movies, music, nominee, nominees, Oscars, review. Bookmark the permalink.